I would appreciate to be credited within your project, if you use any of the source code below. If you have an interesting project going on, I'll be glad about feedback. The software below comes with no guarantee or warranty except for my good intentions. Further the use of this code implies that the user has a fundamental understanding of electronics and its risks. I'm not responsible for any harm or damage, caused by inproper use of any of the code below. Any commercial use of parts or all of this code requires the permission of the author. The code will be inline expanded. All you need is to specify the necessary registers in front of the include statement in the main program, e.g. Standard macros for bank and page handling and conditional branching. Device-specific customization of macros by using #DEFINE TWO_BANKS for adjusting macro instructions to small PIC MCUs with only two register banks in order to optimize the corresponding code size. Parameterizable wait function, which performs a "busy" wait. Suitable for all Microchip PIC MCUs with an internal 8-bit timer (routine uses TMR0). Beep function on parameterizable output port. Provides basic 16-bit arithmetic routines such as CLR16, MOV16, NEG16, ADD16, SUB16, CMP16, LSR16, LSL16, INC16, and DEC16 operations and the corresponding immediate operations, if applicable. Note that the data lines have to be on the low nibble of the port. Based on timing constraints, no busy flag check. So if LCD fails, system is still running stable. Higher reliability, because less critical system components. No portable code for higher clock frequencies. R/W connection to LCD supported for compatibility to m_lcd_bf.asm, but can be put to GND at LCD side => You'll get one interrupt pin more on the processor side. Extended m_lcd.asm with the ability to define your own characters (max. 8) in macro LCDspecialChars. 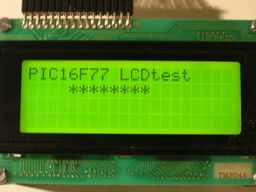 Based on timing constraints, specifications as m_lcd.asm. R/W connection to LCD needed for hand shaking. Clock independent program code, successfully tested up to 10 MHz on PIC 16F84 and up to 20 MHz on PIC 16C74A! Gives the best performance, but system fails, if LCD (-connection) fails, because processor is waiting for ready signal from LCD to send next character. => Deadlock, but should not occur under normal circumstances! Basically the same as m_lcd_bf.asm, but with the ability to define your own characters (max. 8) in macro LCDspecialChars. Bi-directional communication, reads busy flag of LCD. Basically as m_lcd.asm, but with the ability to independently configure LCD control and data lines, i.e. LCD data on low nibble of any port, LCD command lines on any port bits (even different port). Basically the same as m_lcde_bf.asm, but with the ability to define your own characters (max. 8) in macro LCDspecialChars. Bi-directional communication, reads busy flag of LCD. 8 bit binary to decimal conversion routine for LCD output, stringent for any numeric display output or interaction. 16 bit binary to decimal conversion routine for LCD output, stringent for any numeric display output or interaction. 8 bit binary LCD output routine for debugging of registers and bitstreams, e.g. to visualize the binary output of an A/D converter to check the magnitude of its LSB toggling due to digital quantization and/or noise. 16 bit binary LCD output routine for debugging of registers and bitstreams, e.g. to visualize the binary output of an A/D converter to check the magnitude of its LSB toggling due to digital quantization and/or noise. Software-based RS232 communication for all Microchip PIC MCUs. The routines handle all aspects of RS232 transmission and reception, based on busy waits. The MCU port for RS232 transmission can be selected freely by the user, provided it is an active digital push/pull port. The MCU port for RS232 reception is limited to PORTB,0 due to its own interrupt flag. Note that for external interrupts, such as the RB0/INT pin or PORTB change interrupt, the latency will be three to four instruction cycles. The exact latency depends on when the interrupt occurs. The latency is the same for both one and two cycle instructions. Completely software handled RS232 Interface for interrupt featured PICs (PIC16C84, PIC16F84,...). Developed for an old and heavy matrix needle printer with RS232 Interface. Code is optimized for 1. small memory, and 2. optimal execution time. If extern sources are called from within modules, set absolute pathes. Please refer to Known Limitations of MPLAB IDE below. Declare and define the required registers and statements in the MAIN. Declarations of constants and registers need to be listed in the MAIN before the '#include' statement of the modules, since most modules are referencing specific constants and registers (therefore they need to be defined at that time). Manage the used registers in a clear structured way. For prototyping, it is recommended to introduce temporarily dedicated registers for each new code segment. At the end, when everything runs properly, you can start to optimize the design in order to share as much registers as possible to save memory space. Otherwise, you run the risk of getting data consistency problems - bugs, which are really hard to solve! Provide dedicated registers for interrupt handling! Do not call subroutines from the interrupt service routine (ISR), which are executed during normal operation. If so, ensure to perform a complete context save of all registers being used within this subroutine. Interrupt flags have to be cleared by software before re-enabling the 'global interrupt enable bit' (GIE) and exiting the ISR. Otherwise, recursive ISR calling occurs. - If the interrupt service is entirely completed within the ISR, re-enabling is suitable at the end of the ISR. This applies only, if disabling of the interrupt source has been carried out at the beginning of the ISR. Previously MPLAB worked with the old MS DOS 8.3 naming convention (so set paths with old notation). However, recent MPLAB versions seem to accept also longer file names. That's why my include files sometimes have strange names. Note that there is also an upper limitation on the amount of characters for file names including path. Without using the MPLINK linker, i.e. for absolute/non-relocationable assembler code, file names including path are somehow restricted to 62 characters (see MPLAB IDE Quick Reference, p.3). '#include' - commands in the MAIN could be relative (..\..\xyz.asm) or absolute paths (C:\abc\xyz.asm). '#include' - commands in extern source have to be absolute paths (if extern source is called with relative path). If you use 'set' instead of 'equ', you can assign different labels to the same register. This is very useful, if you need temporary registers in different modules. But be careful that you do not write and access the same register alternating in 2 different procedures. This results in nice bugs or possibly endless loops. 'equ' is exclusive, i.e. it accepts only one label for each register. Automatic Table Generator for MPLAB Assembler. To specify exact periods (e.g. with busy wait module m_wait.asm), I use quite often the MPLAB stopwatch. This is a very convenient cycle-accurate timer, which takes both 1 cycle (e.g. incf) and 2 cycle instructions (e.g. goto) as well as special instruction mnemonics (e.g. bnc, subcf) into account. having been reset at 'bsf TXport' and run to the 'nop' statement. The latency of the 'WAITX d73,d2' statement within this setup (4 MHz clock, PIC16F84) turns out to be approximately 150 ms.
to get the entire site.